When you create a char in world of pirates, you have four nations to choose between, Spain, English, France or Holland. 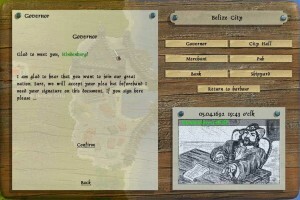 But you are able to change nation in game, you can change to one of the starting nations or too Portugal or go Pirate. You can also buy a nation change in the store, buy it here. To desert to another nation, you need the title of Petty Officer First Class, at the nation you wish to join. You can join all four starting nations and Portugal this way. When you have the title at the nation you wish to join, you then have to go to a city of this nation. Go visit the governor and declaim a request. Press Join the nation of this city to do so. You will now get a message and have to confirm that you really want to join this nation. If you do not wish to join, press back or any of the options to the right. When you confirm to join the nation of the city, you will get your new nation color and a welcome message from the governor. Note that when you leave your nation, you will lose up to 250.000 reputation points at the nation you left. But never lose more then to reputation 0 or stay at the negative reputation you already have.